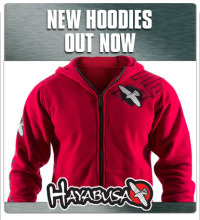 We’ve just taken stock of 4 stylish new Hoodies from Hayabusa! The new Hayabusa Champion Hoodie is a retro, American college style design featuring a high quality embroidered Hayabusa crest motif on the chest. The more minimal looking Hayabusa Cast Hoodie features a variation on the Hayabusa logo crest on the chest using the same high quality embroidery. Both Hoodies are made from 100% cotton and are extremley comfortable, they are also both constructed using premium quality stitching. So, what are you waiting for then!? Check out theAi? ?NEW HAYABUSA CHAMPION AND CAST HOODIESAi? ?now available to buy from our site. This entry was posted in News and tagged Hayabusa, Hayabusa Hoodies, Hoodies, MMA, MMA Hoodies, New Hayabusa Hoodies on 31.07.2013 by .